Happy Rocky Road Ice Cream Day! Despite the chilly weather we’ve been having here in PA, I’m determined to celebrate anyways! According to TheChow.com, Rocky road ice cream was invented during the Great Depression. It served as a way to take people’s minds off the rocky road their own life was going through. 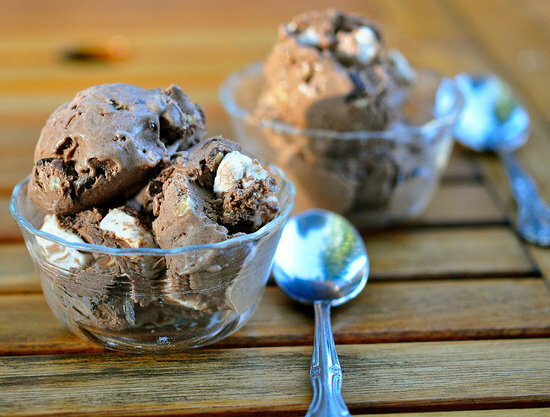 Rocky Road Ice Cream traditionally consists of chocolate, nuts, and marshmallows. However, many varieties exist. Because you know I love to bake, I also want to share a few other recipes I found inspired by the great ice cream. includes chocolate chunks and pecans. It does require an Ice Cream Maker, however you can find a good one for only around 20 bucks @ Target or Kohls. Don’t be intimidated! Think homemade rocky road Klondike bar! To make this recipe even simpler, you could even use store bought ice cream! This foolproof fudge has all the great flavors of rocky road , but it’s made in the microwave! have all the rich flavors of rocky road in a gooey brownie package. These bite size cookies are the perfect size for lunchboxes and small hands. If your kids don’t like nuts you could always leave them out. Recipes are about taking ideas, and adapting them to your family. Do you like Rocky Road ice Cream? Or what is your favorite flavor? Please let me know in a comment i’d love to hear from you!